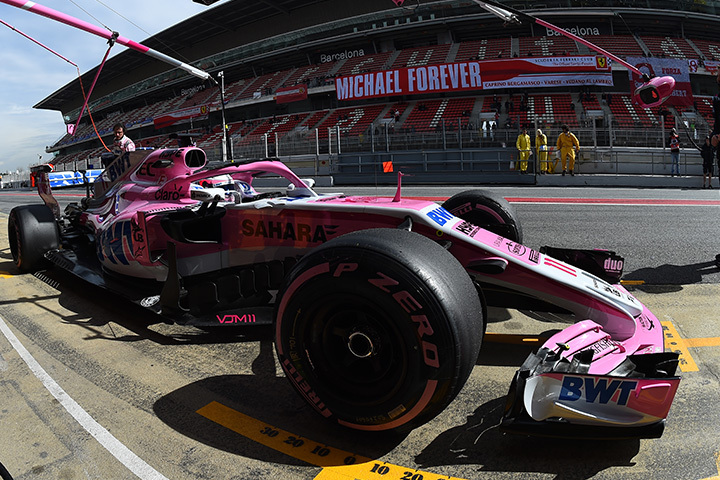 Seven of the current 10 Formula 1 teams have a base in the United Kingdom: a country at the very heart of the sport since its inception (it’s no coincidence that the first Formula 1 race valid for the championship was held at Silverstone, in 1950). 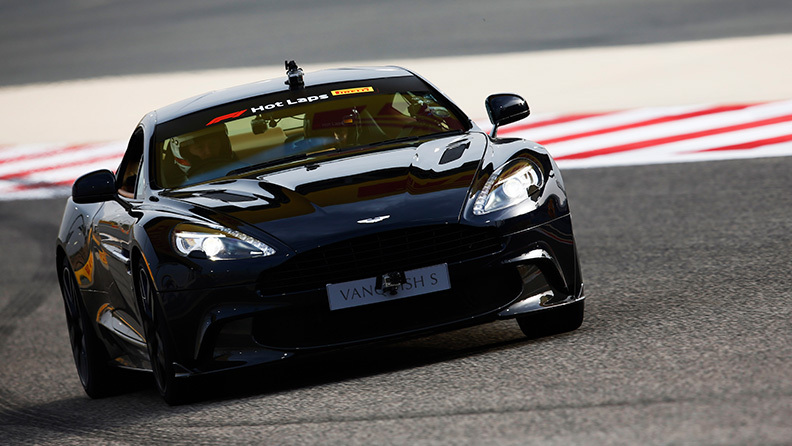 So, it’s probably appropriate that the debut of Pirelli’s Hot Laps programme for this year, starting in Bahrain and continuing throughout the long-haul events as well as some in Europe, features two iconic British sports car makes: Aston Martin and McLaren. Other marques will join them throughout the year, as part of a ground-breaking concept designed for people to experience the feeling of being driven at speed on a Formula 1 circuit during a race weekend by a top driver, in a supercar running on Pirelli P Zero tyres (which are chosen by about half of the world’s premium and prestige cars as original equipment). 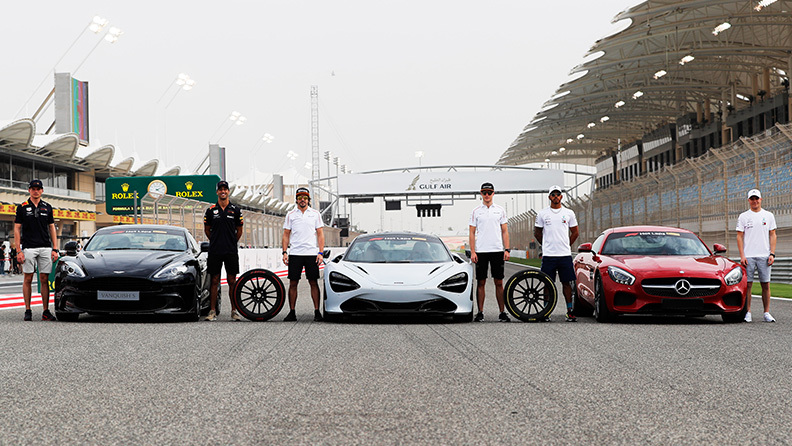 For now, it’s Aston Martin (an innovation partner of Red Bull) and McLaren leading the way, in a series of Hot Laps sessions throughout the Bahrain weekend that showcase the capabilities of their latest supercars along with the P Zero tyres that have been specifically created for them. 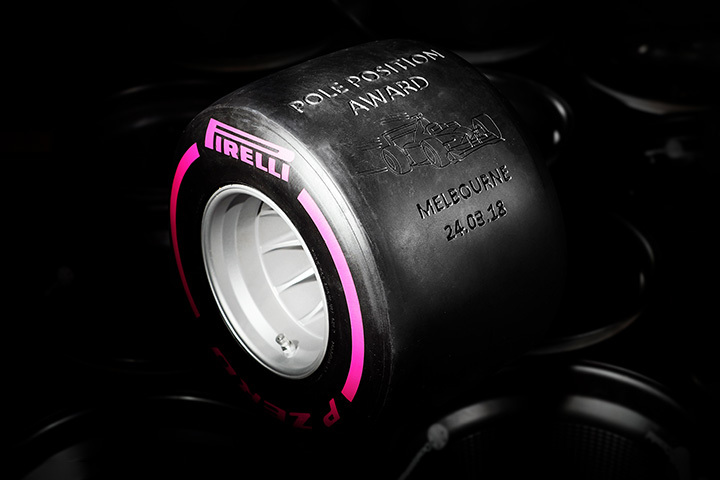 It’s all part of Pirelli’s ‘perfect fit’ strategy, which denotes P Zero tyres that have been especially made as part of the holistic design philosophy of the whole car, with Pirelli working in close collaboration with the manufacturer to create a tyre that operates in consummate harmony with the chassis. One example of this way of working is with Aston Martin, as Pirelli equips a number of the company’s latest models. And to discover just how integral and all-encompassing the relationship is, it’s enough to look at the list of names that has been put forward as the drivers on the Pirelli Hot Laps programme. These not only include race car drivers Daniel Ricciardo and Max Verstappen, but also such luminaries as Aston Martin CEO Dr Andy Palmer, and the company’s chief creative officer Marek Reichman. Both men are the real driving forces behind the whole company: Reichman being responsible for the company’s iconic designs summarised by Aston Martin’s ethos of doing things ‘for the love of beautiful’. One of them is the Vanquish S: probably the ultimate grand tourer, which will be put through its paces at the Sakhir track. Powered by a sonorous V12, the Vanquish S has an entirely carbon fibre body, giving it an enviable power to weight ratio with headlining performance figures that aren’t too far away from Formula 1 (around 323kph top speed and 3.5 seconds from 0-100kph). Putting that power onto the road is the job of its bespoke P Zero tyres, marked ‘AM’ for Aston Martin. 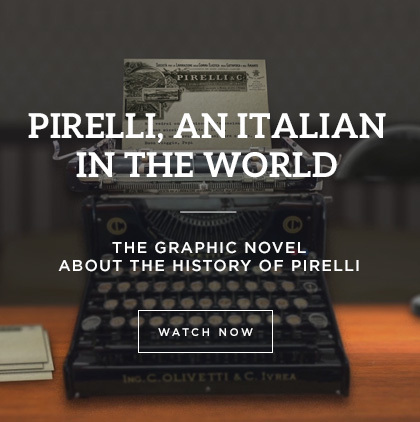 Many of the lessons that Pirelli learns through motorsport – including Formula 1 – are transmitted straight onto the road for everyday motorists to enjoy, thanks to ultra high performance tyres such as the P Zero. McLaren is represented thanks to the 720S (a reference to its horsepower figure); the company’s new sports car that was launched last year to replace the 650S. Like the Aston Martin, it relies heavily on carbon fibre, but the engine architecture is completely different: the McLaren is powered by a 4.0-litre twin-turbo V8. The result is a car that’s even faster than the Aston Martin, but it’s worth remembering that they are built to do two very different things: the Aston is a grand tourer whereas the McLaren is intended as an out and out sports car: incidentally, the lightest car in its class. 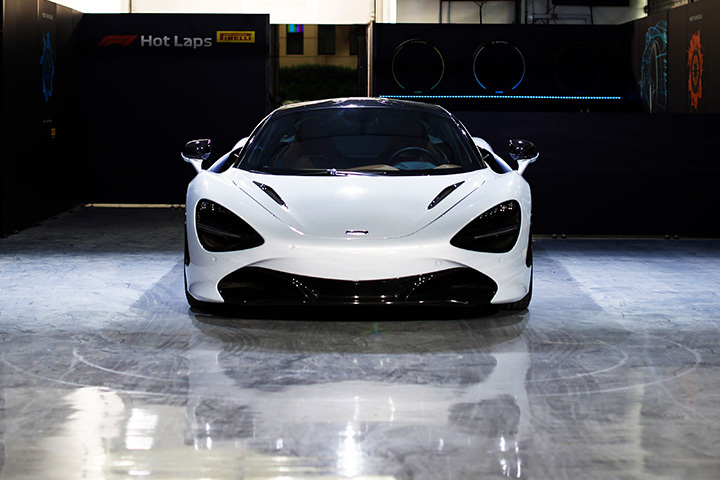 Among the design influences for the 720S, as well as the iconic McLaren F1 road car from 1992, is the great white shark. One of the colour options is ceramic grey, enhancing the resemblance considerably. Adding to the predatory aspect of McLaren’s amazing supercars is the driver line-up of Fernando Alonso and Stoffel Vandoorne, who are scheduled to take the wheel during Pirelli’s Hot Laps programme this year. 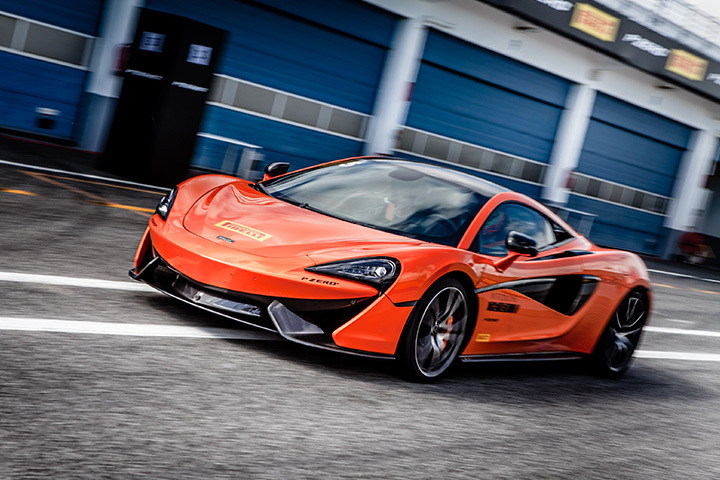 All road-going McLarens leave the Woking factory exclusively equipped with P Zero tyres, with the 720S being fitted either with P Zero or P Zero Corsa tyres: the latter with a racing style compound and tread pattern. Now, McLaren’s ‘shark’ comes to Bahrain.